At Overhead Crane & Conveyor Services, it is not only our depth and breadth of expertise regarding numerous types of crane systems that has helped us succeed, but our dedication to providing personal service that has earned us a sterling reputation among customers in a wide array of industries. In 2011, we were contacted by the Dement Construction Company who is located in Jackson, Tennessee. 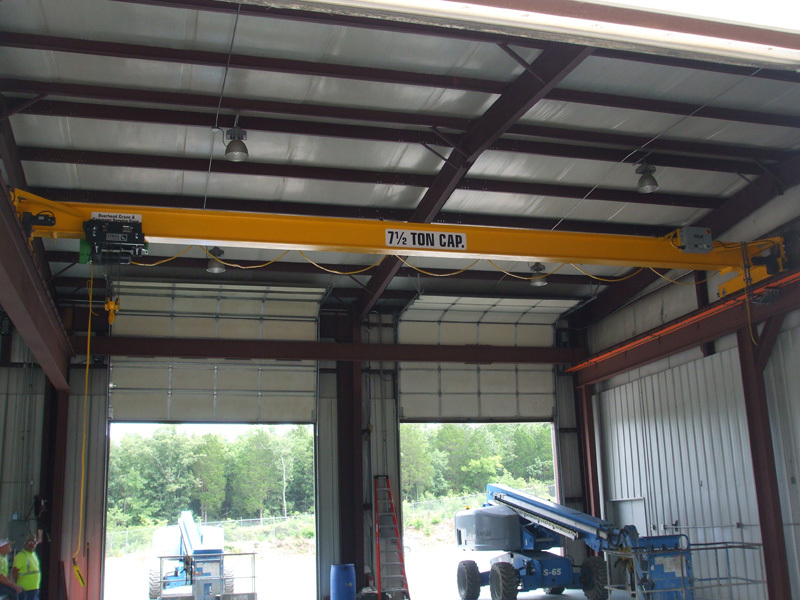 Our team had previously provided two 7.5 ton crane systems and one 5 ton crane system for their headquarters, and they requested that we quote a turnkey package of a 7.5 ton top running crane and runway system for their new facility in Christiana, TN. While the customer had hoped to use us as their crane provider on this project, our quote came in above the allocated budget. However, when we had visited their existing facility to discuss the project, we had noticed that they had amassed a large inventory of structural steel shapes from various bridge construction projects they had been involved in. To reduce the overall project costs, a revised proposal, which included the incorporation of these leftover parts into the runway design, was presented. At that time, we also learned that the customer was about to complete a large contract project and was looking for a way to delay laying off as much of their iron and millwright crew as possible. Through negotiations, it was decided that we would oversee the design, fabrication and installation of the runway and crane package, utilizing their crew for the onsite fabrication and installation processes. After sifting through four acres of discarded structural shapes, we chose two 60' beams that could be fitted with center caps and used for the runway in the bay which was specified to span a full 59'. These beams had not lost any structural integrity, but did contain numerous holes and rivets from their previous use. The construction crew went to work cleaning and repairing the beams while the crane system and span holders were fabricated in our facility. Once fabrication was complete, the system was installed at the jobsite using miter cut the W8 x 31 beams to allow attach of the column sides to the underside of the runway beams. Overall, this was a long project with a number of unique revisions, but it resulted in a job that was completed on time, on budget, and to the customer's specifications. While many fabricators simply submit a bid and go on, we strive to provide the highest level of service in the industry and can work with customers to accommodate unusual needs. For additional information about this custom crane fabrication project, see the table below, or contact us directly.